Maybe you have heard some of the recent chatter about reinventing The Gallery, and maybe you haven’t. Either way, I hope to provide you all with some value in this post; which by the way, is my 300th Blog Post on PhillyUrbanLiving.com (hard to believe that one, folks). Okay, a little Gallery history to start. The Gallery at Market East was built in 1977, and was designed to be a suburban-esque solution for city residents, workers, and visitors. Cities were struggling back then, and suburban towns were booming; all across the US. People loved their malls (as many people still do today); it was also the prime shopping solution for every Greater Philadelphia suburban enclave. A good mall made your little town cool (e.g. King of Prussia, Willow Grove Park, etc). With Center City’s retail environment struggling to survive in the 70s and 80s, the City of Philadelphia made a huge attempt to bring suburban shoppers back downtown. Hence, they built a 4 story behemoth of an urban mall to compete with neighboring suburban areas, and so The Gallery was born. Growing up in the suburbs, my parents used to take my 3 siblings and me into Center City every year for the Christmas Light Show (formerly known as Wanamaker’s, now known as Macy’s) and Dickens Village. We would all hop on the train in Jenkintown, and cruise down to Market East in 30+ minutes. Market East is located at the bottom of The Gallery, which back then was considered the “cool city mall” to us suburban folk. It was an awesome tradition, and one that I still continue to honor annually during the holiday season in Philadelphia. Fast-forward almost 40 years from The Gallery’s start, and look what has changed. Center City’s retail scene went from sluggish to dynamic, our restaurant/entertainment scene is now considered to be one of the finest in the US, and the population of people living downtown just keeps growing. So needless to say, The Gallery could use a fresh look that appeals to today’s consumer; as it takes up a good amount of valuable downtown real estate. So as to not build up any more suspense, The Gallery 2.0 wants to reinvent itself as the Fashion Outlets of Philadelphia! I’m not saying that this project won’t be great, because it has already drawn the attention of Mario Batali + Joe Bastianich’s Eataly (as a potential anchor restaurant), but the name could definitely use some work. As for my own professional opinion, I believe the reinvention of The Gallery might be better suited as a mixed-use development rather than just a shopping/dining destination. By mixed-use, I mean it could have a retail component, an office component, and a residential component that take advantage of its location. 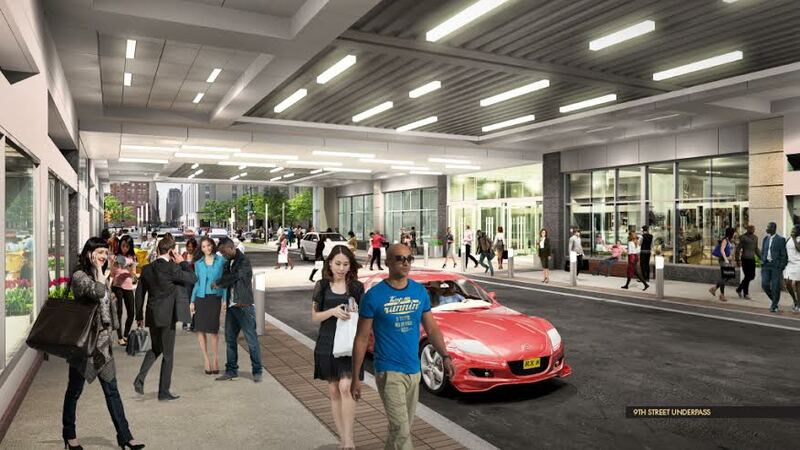 The Gallery is located in one of the most convenient spots in all of Philadelphia, it has access to all forms of public transportation, and the Market East neighborhood is only going to get bigger and better in the years to come (Hello, East Market et al). Don’t get me wrong, outlet stores can be great. Higher end merchandise, lower end prices; but I think the name is a little weak. Please take these ideas with a grain of salt, as I’m just doing a bit of brainstorming here. I am by no means a retail expert. Please also note that I am not displeased with the idea for Fashion Outlets of Philadelphia, I just think the parties involved (that includes you, City of Philadelphia) could put a little more thought into the long-term effect of a project this big and important to Philadelphia’s urban core. Will outlets be as popular as they are 10 years from now? Will fashion still be the primary retail option at Fashion Outlets of Philadelphia 20 years from now? These are some of the reasons why I feel the name should be revisited (even though I know “Fashion Outlets” is a brand unto itself, and part of the reason why it is being named as such). A name says a lot, and this development’s name will hold quite a bit of weight for Center City in the years to come. I think it's a natural progression to its success to continue to add unique retail opportunities for the local community.